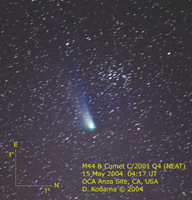 Comets make interesting challenges for astrophotographers because each comet has a unique look to it, depending on its composition, orbit, and distance from the Earth. There is a certain anticipation with each one when it nears the sun as we hope for a good show. For the most part, comets pass by us only once, and even if they do come back, the vast majority are seen only once in a lifetime. They do hang around long enough (unlike meteors) to give us a few chances to take photographs, but have their own challenges - generally they are near the sun (sunrise or sunset) and low in the sky. 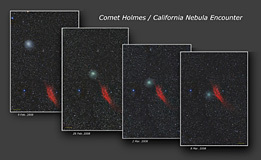 The combination of a bright, changing sky background coupled with a faint wispy tail keeps the challenge fresh for each comet. 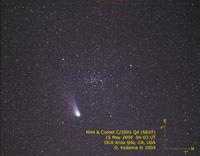 Why are there several comets named "LINEAR"? An increasing number of comets are being discovered by automatic (robot) telescopes which are engaged in searching for potentially earth-threatening asteroids. LINEAR is one such project. 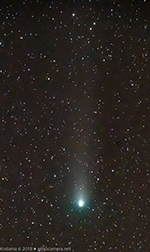 Why do I see two tails on some comets? As comets approach the sun, the energy from the sun causes the outer layer of the comet to warm up and boil off the comet's surface. Some components of it also become electrically charged and interact with the sun's solar wind. 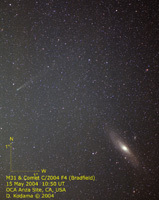 This fluorescing ion tail is generally thin, usually looks blue in color photos, and generally streams straight away from the direction of the sun. The uncharged particles are mainly pushed and lit up by sunlight and appear as a white or yellow diffuse cloud trailing from the comet head. Solar radiation pressure "blows" the dust outwards, with smaller particles affected more than larger particles, causing the cloud to spread out in a broad fan. 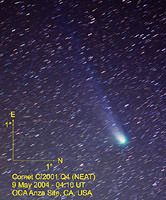 In either case, note that you can't tell the direction of motion of the comet by the orientation of the tail. Why are the stars trailed in comet photos? 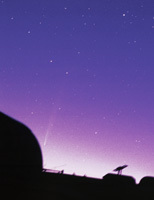 Comets are usually moving fast enough relative to the stars that the camera must follow the comet during the exposure, causing the stars to appear as lines. 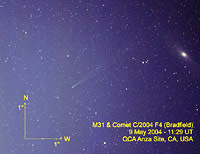 The bigger and brighter the comet, and the faster the camera system, the less trailing will be visible in a photo. Why don't I remember hearing about these comets? 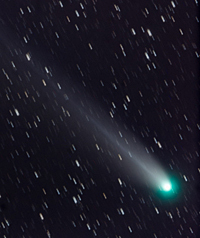 Most comets come and go without being noticed by the general public because they don't become bright enough to be visible without binoculars or a telescope, especially when drowned out by the lights of a city. 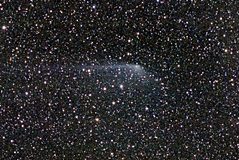 At any given time, there are perhaps a half-dozen comets visible in amateur astronomers' telescopes, most as just dim fuzzy balls without a distinct tail.